Posted on February 11, 2018 February 12, 2018 Author Robert Cotto Jr. But almost always, during the initial stage of the struggle, the oppressed, instead of striving for liberation, tend themselves to become oppressors, or “sub-oppressors.” The very structure of their thought has been conditioned by the contradictions of the concrete, existential situation by which they were shaped. Their ideal is to be men; but for them, to be men is to be oppressors. This is their model of humanity. On December 19, 2017, the Hartford Board of Education shared a plan that included the possible closure of four schools, including Batchelder and Simpson-Waverly. Just about a month later on January 23, 2018, the Board voted to close these schools. Beyond official statements that the plans will save money to re-invest in all schools, the closures only make sense when considering that some parents have more power in the city than others. In other words, some parents appear to matter more than others. Despite the way that the word “parents” is often used as a unifying term, not all parents are treated equally by the school system in which their children attend. 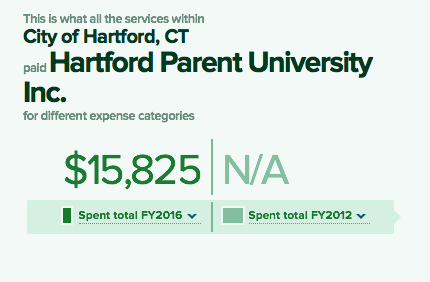 After years of poorly planned expansion of school choice programs and State and City of Hartford underfunding of the Hartford Public Schools (see Equity 2020: How We Got Here? ), parents are often positioned as competitors for spots in schools, buildings, and for power over decisions in the school district. Power has different forms. There are formal and informal forms of power. This power can be economic, political, or moral. When groups or individuals make demands on an organization, their power, resources, and networks shape what happens. When an organization like the Hartford Public Schools makes decisions, some groups are able to use their power to make demands, while others appear powerless to stop them. The case of Batchelder School and Montessori Magnet is instructive. The data shows that Batchelder school is not being closed because of academic performance or low enrollment. To this date, there are no clear benefits in terms of services, programs, and funding that would go to the Batchelder parents and students when it closes to them and they must relocate to other schools. Also, I have suggested that the Board’s policy to close schools has not been followed in this case. Instead, the closure of Batchelder makes way for the Montessori Magnet School to move into that building once the former is closed. After watching the video recording from the school-based hearing, it was clear to me that the parents, teachers, and students understood the “closure” of Batchelder as their own displacement to benefit Montessori Magnet students and parents, which would take over their school building. Speakers did not identify any benefit to them by moving to another school. Batchelder Elementary School is in the Southwest corner of the city. The school of more than 400 students has roughly 75% students that are Puerto Rican and Latino and slightly more than 20% are Black students, while there were a small number of white students. Most students were eligible for free and reduced lunch in 2016-17. It’s a non-magnet school in a quiet area of the city near Newington, West Hartford, and Wethersfield. Most students reside in the Southwest area of the city and there are about 100 students that walk to this school. Until December 2017, the Batchelder school had never been mentioned as a candidate for closure. Surprised by the decision, one parent told me that they first heard of the school closing on the nightly TV news at 6 p.m. on December 19, 2017 while the board meeting took place. Another told me that she heard about the school closure from a student at the school the next day. Despite significant protest from Batchelder parents at two different public hearings (one hearing was only a day before the Board’s vote), the Board of Education voted to shut the school down and, in effect, give the building to Montessori Magnet. In contrast, very few people came to support the District’s plans to close schools. In 2013, this small local Montessori program became an interdistrict magnet school after a rushed process to boost the State’s desegregation settlement, heavy lobbying at the school board meeting by parents, and a vote by the Board. Today Montessori Magnet School at Moylan has about 300 students with 50% Latino and Puerto Rican students and about 25% Black students and 25% white students. As a magnet school, roughly half of the students and families live in the suburbs and half in the City of Hartford. More than half the families pay full-price meals and less than half are eligible for free or reduced price meals. By design as a desegregation program, this school is more affluent and mixed-race than a traditional school in Hartford. The school is co-located or shares space with the large Expeditionary Learning Program at Moylan School. The shared space situation is cordial, but not ideal. Several years ago, the Hartford Public School Superintendent, State of CT, and Mayor of Hartford Pedro Segarra proposed to move the Montessori Magnet to West Hartford, far from its current location. While the debate was contentious, many Board members and a number of parents thought it was unwise to move the school so far away that local parents would have trouble getting to the school. meaningful opportunity to be heard. 2. Moving the school out of its community, let alone out of Hartford, puts the very fabric of the school we have built in jeopardy. 3. The proposed location puts a significant portion of our school community at risk of disenfranchisement and severely limits the school’s future ability to serve Zone 3 families. 4. Moving a Hartford elementary school out of the city is unprecedented and lays the foundation for a slippery slope. We appreciate your response and as a community we agree that our decision needs to be made together with our Montessori Magnet community having a seat at the table representing the community, and our children. We feel that the data listed below clearly demonstrates how the majority of our community (91.5%) feels about moving our school community to FranklinAvenue as a temporary location. Our community, according to the data gathered, would like to remain in our current temporary location rather than go to Franklin Avenue as a temporary location. We as a community are against moving to Franklin Avenue as a temporary location. We expect to be fully included as part of this decision-making process along with you to insure our students and community are represented and that we are aware fully of all options being considered for our school. The benefit of having us at the table with you making these decisions and providing information will be transparency in the decision making process. We need to be fully involved in this process to insure our community and students are able to settle in the best possible permanent location. In this example, Montessori parents exerted their power and stopped a move to West Hartford and Franklin Avenue. They wanted to be part of the process to stop their move from Moylan school to 425 Franklin Avenue. Montessori parents have faced broken promises and poor planning by the State, City, and Board. Parents here have been listened to at times, but strung along with hopes of a new building. It’s easy to be sympathetic to their despair. But in the most recent example, (at least some) parents at Montessori have exerted power to endorse a plan to take the Batchelder School away from other students and families. But what kind of power and by who? Here are some clues. Clearly parents and teachers at Montessori Magnet are in favor of this plan. Even before the Board voted to close Batchelder and other schools, Montessori Magnet staff visited the Batchelder school building to see what modifications it would need to become suitable for a Montessori program. 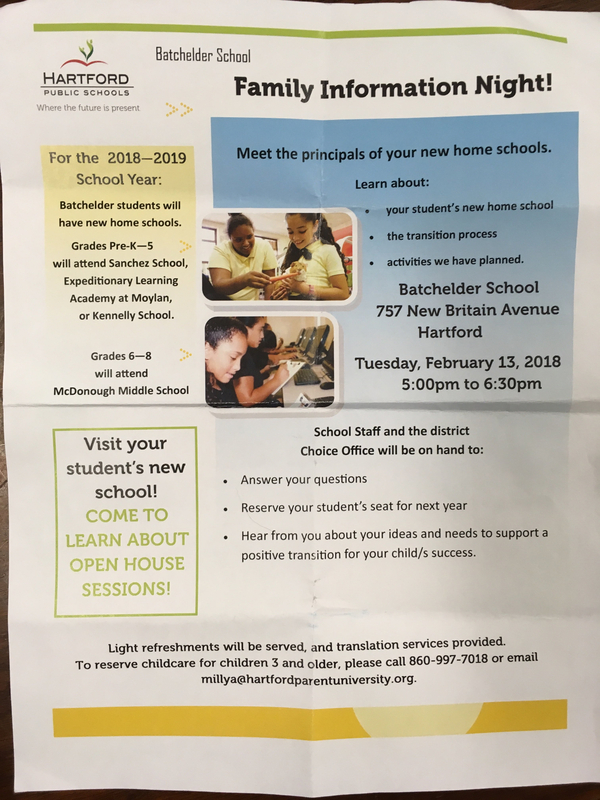 Also, the Hartford Parent University, which has received financial compensation for community relations work in the past (see graphic above), is now working for the school district to convince parents to choose other schools besides Batchelder (see graphic below) as part of a “transition”. In sum, the groups with more administrative power that supported the plan to close schools stood to benefit from these closures in one way or another. Batchelder (and Milner and Simpson-Waverly), parents and students have been asked to sacrifice with nothing in return, while benefits largely go to other parents and parent groups with more power. In the past and present, Montessori Magnet parents, both racially more diverse and economically more affluent, have mattered in terms of district decision-making by having their voices heard and perspectives taken into consideration. In addition, the anti-Sheff/pro-segregation State, City, and Board leadership benefits by having magnet and non-magnet school parents at odds over a school building that belongs to the Batchelder community. By making this decision, these leaders can blame the Sheff plaintiffs and magnet programs for the displacement, while offering no additional resources to any of the schools or taking responsibility for a plan that favors some parents over others. In this case, why don’t the Batchelder parents matter like the Montessori Magnet parents or those in other schools? Power. Author notes: The author served on the Hartford Board of Education from 2010-2017 as one of four democratically elected members on a majority (5 appointed) mayoral appointed board. Hartford is one of only two towns/cities with a mayorally appointed majority on the Board of Education. The other city is New Haven. This preliminary case analysis is for instructional purposes for understanding school choice, desegregation implementation, power, and parent engagement. I couldn’t say it better myself. I have learned that knowing someone with “Power” and “ties” will benefit you more than ACTUAL FACTS. Batchelder School has room to expand, it has green area that benefits our kids to learn about nature. The neighborhood is save and they can feel it. It’s a shame that We (student, parents and staff) are been moved to areas where we don’t feel comfortable or lack the benefits we received from been at Batchelder. They are relocating 436 students to 3 different school and telling families with multiple children that there’s a change Our KIDS will be separated depending on their grade level. If Batchelder Parents were given the same opportunities as the others School to fight for Our KIDS and School the outcome would of been different. Previous Previous post: In Hartford, do Black and Latino teachers matter?